← Davidsonville, Maryland. September 12th, 2011. Monitcello, New York. September 16th, 2011. In the wake of Hurricane Irene, a large sinkhole has formed beneath two roads and through the property of several homes that will cost as much as $1 million to repair, officials say. Village Manager John LiGreci said an enormous volume of water flowed through an aging pipe and loosened the couplings. The excessive pressure during the storm eventually blew out the pipe, and the water washed away earth around it. This erosion continued unnoticed through Tropical Storm Lee. 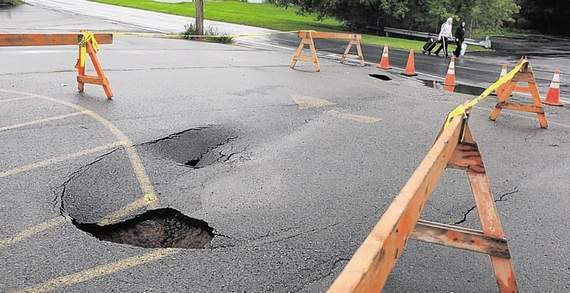 Village officials were called to St. John Street on Friday after a small open sinkhole developed in the parking lot of Ramsay’s Funeral Home. By Monday, the hole was much larger and by Thursday the hole is bigger than a large wheel. The pipe runs diagonally beneath St. John Street through the funeral home parking lot and the yards of several homes to Spring Street. The earth has sunk along this entire course; the outline of the pipe is clearly visible in the grassy sections. The asphalt on the roads and parking lots are buckling or cracking. Spring Street appears to be folding on itself. There are now two open sinkholes in Ramsay’s parking lot. LiGreci said the pipe will have to be replaced. Village engineer John Fuller says the affected roads are temporarily safe to drive over. The village Thursday imposed a 10,000-pound weight restriction and will evaluate the conditions on Friday and Monday. LiGreci said the roads appear to be rapidly deteriorating with the rain. The village might have to close them off and reroute traffic. “We knew we had a small problem, but it has progressed to a large problem,” LiGreci said. LiGreci said Irene also did some damage to the roof at Village Hall and the sewer plant. The plant flooded after running at near 90 percent above capacity during the storm, causing flooding on several roads. This entry was posted in Pictures and tagged Monticello, New York, sinkhole. Bookmark the permalink. 1 Response to Monitcello, New York. September 16th, 2011.